“King” Henrik Lundqvist was a goaltending enigma for the Pittsburgh Penguins for nearly three years, but the Pens found their formula via a “qvist” of fate. Henrik Lundqvist’s fellow Swedish countryman, Patric Hornqvist, helped provide the template for frustrating the Swedish goalie by crashing the net and initiating contact, and the Pens “vanqvist’d” their recent playoff nemesis, the New York Rangers, to advance to the second round of the NHL playoffs. Lundqvist was benched for the second time in consecutive games after surrendering 6 goals in 2 periods during Pittsburgh’s 6-3 rout on Saturday afternoon. In truth, Lundqvist’s usurping began on March 3rd when “King Henrik” was bowled over by his own teammate, Ryan McDonagh, in a loose puck chase. The King Flipped His Sh...ahem, net. Lundqvist was apparently asked by the referee whether he was okay to continue, and Henrik allowed his teammates to have a scoring chance at the other end of the ice before throwing what can only be described as a fit as the Penguins came roaring back with a scoring opportunity of their own. The Rangers’ goalie knocked the net off of its mooring, earning a Delay of Game penalty. The Pens failed to convert on the ensuing power-play, but they would erupt for 3 goals in 2:13 to not only put Pittsburgh up for good, but to chase Lundqvist from the game (he would claim to have back spasms). The idea of getting inside of the Swedish Chef goalie’s kitchen became evident when the Pens’ Patric Hornqvist set up shop inside of the crease in game 1, eventually scoring 3 goals. Hornqvist was disruptive enough that another one of Lundqvist’s own teammates (this time Marc Staal) struck him in the face with his stick, leading to Henrik leaving the game. Lundqvist would play okay in games 2 and 3, but the Penguins’ Eric Fehr virtually ran him in scoring the first goal of game 4, and Carl Hagelin would score from within the crease in game 5 to temporarily tie the contest at 1 before the Pens’ 4 goal explosion in period 2. Lundqvist's frustration was evident after Hagelin's tally, and it seemed as though Henrik retreated a bit too far into his net on subsequent shot attempts, giving the Penguins slightly better shooting angles, and Pittsburgh's unheralded snipers (Bryan Rust, Conor Sheary) went to work in carving up King Henrik's legacy and opening questions as to whethr or not his reign was, in fact over. 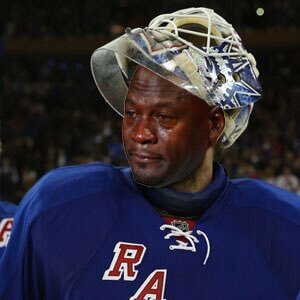 Regardless, Henrik Lundqvist's season is over as his Rangers were exiled from the post-season by a clearly superior Penguins' team. New York will enter their off-season with a lot of roster questions, especially after surrendering assets to get Eric Staal for the stretch run.